The modern aesthetic of this striking home was embraced by the landscape architect during the renovation of the coastal garden. 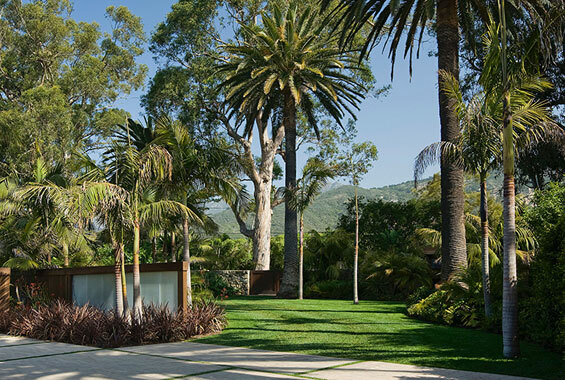 The design of the renovated landscape unifies the site with the residence by embracing the distinctive architectural language and existing plant palette while incorporating contemporary standards of environmental stewardship. The resultant garden is a contemporary landscape informed by the site’s modern flare. This 1.7 acre property is set within a series of narrow residential sites that line the Pacific coast. The existing landscape exhibited little relation to the modern architecture and little cohesion within the context. 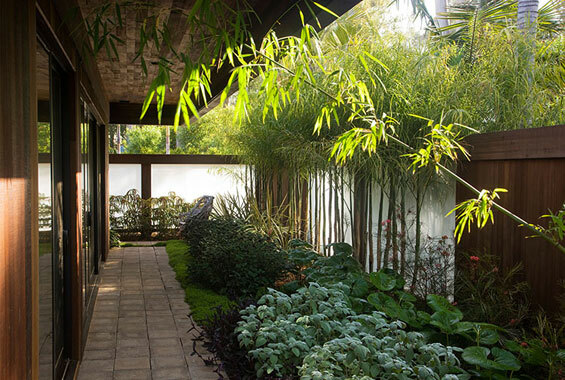 The planting design was dominated by a collection of haphazardly-placed tropical plants accumulated by the previous owner over several decades. The collection had been poorly maintained and had become overgrown through the years. 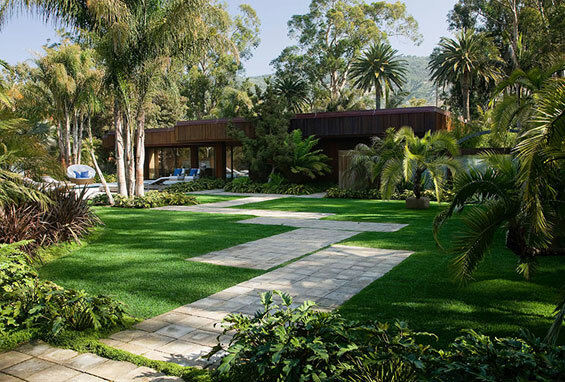 Like the planting, large expanses of degraded hardscape materials in the courtyard and driveway contributed to a pattern of neglect throughout the property. 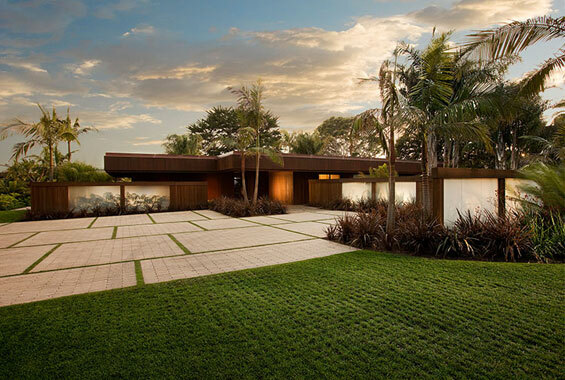 The landscape architect harnessed the strong planar forms of the architecture to create equally bold exterior spaces. At the parking court, offset panels of permeable paving extend the language of the rooftop planes to the ground. 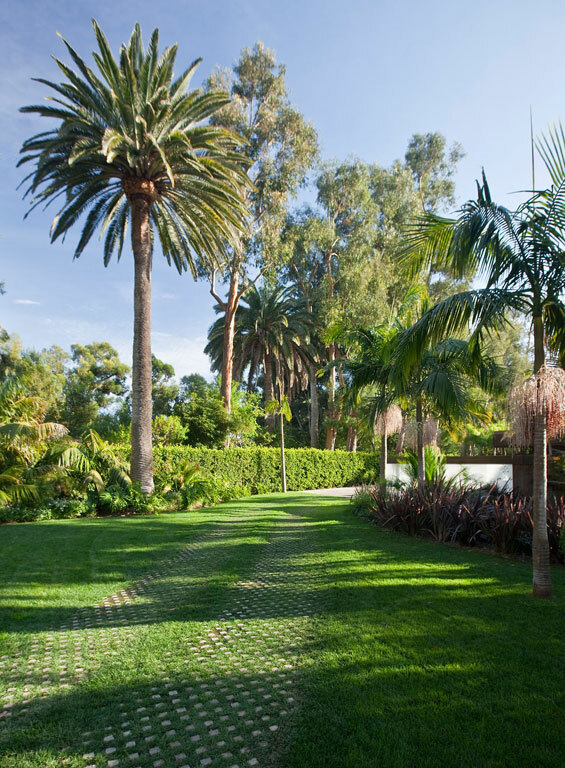 In the central courtyard, similar panels of recycled concrete pavers are set at right angles creating a staggered garden path that leads visitors towards the main house. Redwood, stone, and glass – a palette established by the architecture – was introduced into the landscape in variety of unexpected ways. 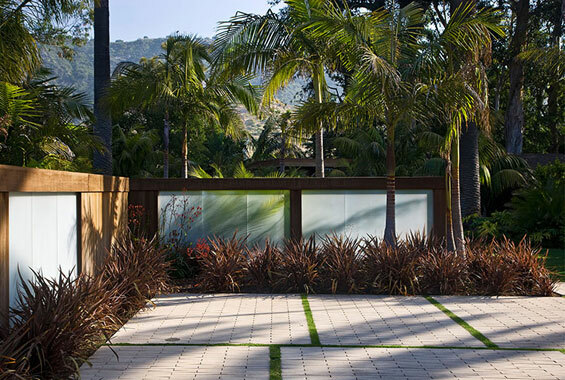 At the pool, these materials were layered to create a striking counterpoint to the house. 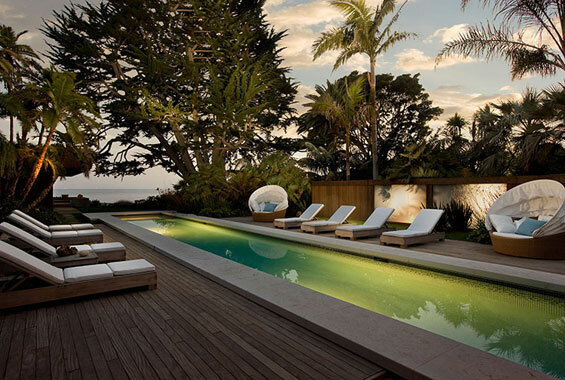 A wooden deck creates a horizontal platform which is punctured by a pool framed with monolithic stone coping. Fading from dark to light, recycled glass tiles reverse the expected gradient as they descend into the pool heightening the shadow line created by the overhanging stone coping. 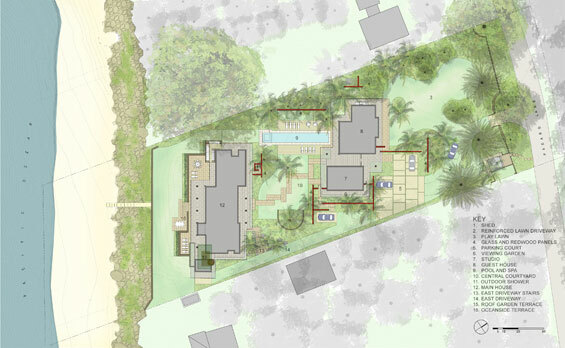 landscape and architecture by defining outdoor spaces, providing privacy, channeling views and creating simple planes. These elements become dynamically activated when flooded with light by receiving unique shadows cast from adjacent plant material. shadow patterns. 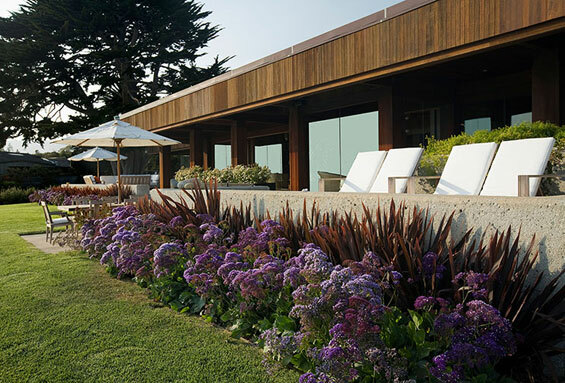 Both along the redwood panels and the ocean terrace, massings of a single color create textural volumes that allow the landscape to achieve the same bold impact as the architecture. 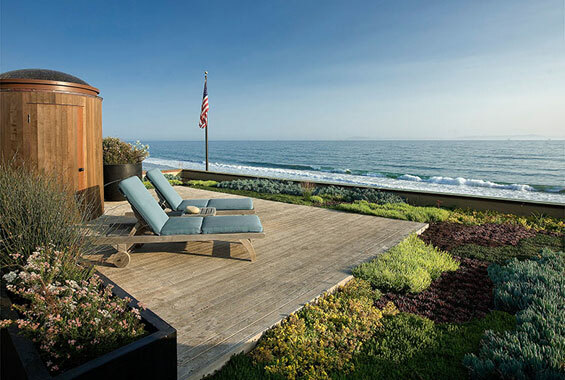 These massings contrast with the patchwork of varied sedums which frame the private roof deck above the master suite. overall level of waste material by incorporating salvaged materials throughout the garden. The original concrete pavers were one of several materials that were salvaged and reused throughout the site. Re-laid, these pavers form the staggered garden path which crosses the central courtyard. Similarly, the redwood and glass panels were constructed from salvaged planking saved during the concurrent architectural renovation. In addition, existing trees and shrubs were tagged, cataloged, and reused in order to significantly reduce the amount of new plant material introduced into the planting design. the amount of concrete pavers in the central courtyard. Finally, the green roof also contributes to a reduction in runoff in this area.